It took just minutes to make the batter and get it in the oven. Different recipes specified various sizes of baking tin (none of which I own), and having opted for my oblong 8″x10″ pan, I wondered if my bublanina would be a bit thin. But as it cooked the dough bubbled up round the cherries (thus the name) and it turned out just fine. I may try it in the 8″x8″ square pan next time to see which I prefer. Apparently the Czechs eat bublanina for breakfast – and why not? We had it warm with a cup of tea for an after-school snack, which I can also recommend. 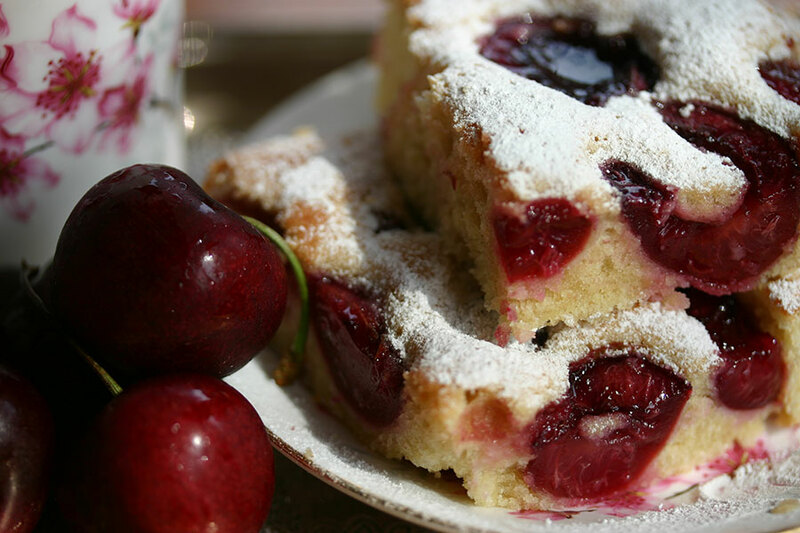 It reminded me of a plum cake I sometimes make, and am sure it would be nice with whatever fruit or berries are in season. Preheat the oven to 350°F (175°C). Butter and flour a baking tray (I used an 8″x10″ one). In a mixing bowl, beat together the butter, egg yolks, sugar, salt, and vanilla. Add the flour and beat again. In a separate bowl, whisk the egg whites until they form stiff peaks, then fold into the batter. Spread the mixture on the bottom of the prepared tin, spread the cherries over the surface. Bake for about 25 minutes, or until golden and firm. Allow to cool slightly, then sprinkle with icing sugar and serve warm. I have never heard of this deliciousness! I’m so glad you remedied that. I’ve pinned!